The annual BASA Awards recognise the contribution of the business sector to the arts, across all genres. Imaginative, innovative, and cost-effective partnerships between business and the arts are highlighted, demonstrating the potential for synergy, the window of mutual opportunity, and the far reaching benefits for business, for the arts, and for all South Africans. The 19th annual awards express the transformative power of art and fire - the vitality of the creative furnace. Creative power is about having the ability to manifest a creative idea. Like a spark to a flame, creativity can turn any context into opportunity for art to blossom. Using the intense energy and engagement with the material of ceramic clay, a group of unemployed amateur artists from Smartie Town near Macassar, Somerset West, Lucy Africa, Martha Nero, Jason Jack and William Jack, brought together by contemporary artist Belinda Blignaut, are using the idea of art therapy as a fine art. The artists give shape to both autobiographical experiences rooted in their socio-political contexts, and the urgency for protest that so many communities are currently expressing on our national stage. The creative team collaborated on creating 24 individual ceramic pieces for the different BASA Award categories and sponsors' awards. Each of the award pieces embody the personal sense of empowerment the artists have gained through the creative process and the transformative energy of artmaking. 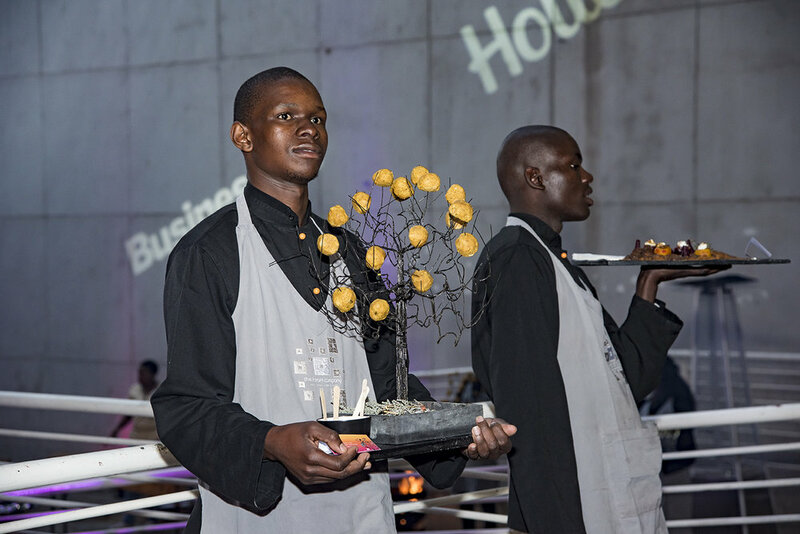 The Awards function was held at Shine Studios in Braamfontein, with the iconic Nelson Mandela Bridge and Johannesburg’s instantly recognisable skyline providing a stunning backdrop. To illustrate BASA’s footprint in the city, we plotted a number of the organisation’s grant recipient projects on the venue’s glass walls. The rest of the awards collateral, which included a multilayered audio visual presentation, was focussed on the 2016 award theme and award artworks.